The film’s title THE RIDER tells it all – what Chinese director Chloe Zhao’s film is all about. The film centres on a rodeo hopeful’s life after his dreams are dashed following a serious rodeo accident. The audience sees the pain right at the very start when Brady Blackburn, a South Dakota cowboy (Brady Jandreau) manually takes off the medical staples from his wounds. The accident is seen from a video recording, the audience obviously spared the gore and blood. Zhao emphasizes the claustrophobic life of Brady, despite having the open ranges. He lives with his often drunk and gambling father and mentally challenged sister, Lilly (Lilly Jandreau). His few friends provide him a drinking outlet but it is the rodeo that makes Brady, the man. If a cowboy cannot ride, then what good is he? These be Brady’s own words. With his injury his brain is sensitive and riding rodeo might be the end of him. Zhao shows Brady’s outlets for his anger. One is the breaking in of a wild horse, named Apollo. It is sad that the horse has to eventually be euthanized as a result of a nasty accident. In another outlet, Brady wrestles one of his young buddies, James but ends up unable to control his inner anger. 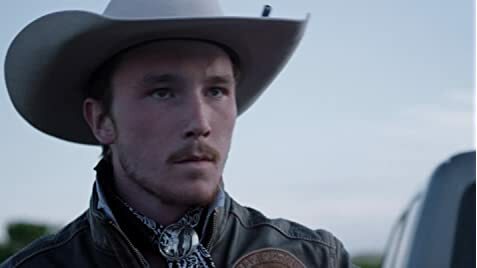 Brady Jandreau, a wrangler in real life does an ok acting job, but his riding and horse handling that are more important. Zhao stays away from any romance in her story. Zhao builds good characterizations. The father is not a one sided cardboard has been. Despite his constant arguments with his son, it is shown at the end that he understands Brady and his decisions. Brady’s anguish, anger and decisions are also well displayed. The horse training and rodeo segments are effectively shot and exciting enough. Joshua James Richards captures the landscape of the open areas of the west, where horses run free. For a female, Zhao captures the male world of male cowboys surprisingly well. There are only few female characters like Lilly and the absent mother. Female directors are fond of making their male characters cry on film. Brady does burst into tears at his breaking point in the film. Rather than showing his weakness, it shows his desperation. He also has to work at a supermarket to support his family. Like her previous feature SONGS MY BROTHERS TAUGHT ME, she blends in the real life of her character actors into the characters of her story. This results in a sort of documentary but realistic feel in the film. It is clear throughout THE RIDER that Zhao’s film is an artistic, well thought out process. She does not resort to cheap sentiment. There are few outbursts in confrontations. Dialogue is simple and effective. Zhao is fond of long slow takes to capture the mood of a segment. THE RIDER premiered at Cannes Directors Fortnight Section to rave reviews. It is easy to see why. Simple storytelling, a good human story and one dealing with nature makes this an excellent film. 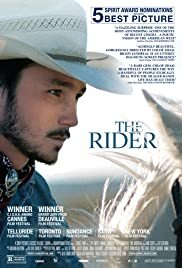 The film centres on a rodeo hopeful’s life after his dreams are dashed following a serious rodeo accident. The audience sees the pain right at the very start when Brady Blackburn, a South Dakota cowboy (Brady Jandreau) manually takes off the medical staples from his wounds. Zhao emphasizes the claustrophobic life of Brady, despite having the open ranges. He lives with his often drunk and gambling father and mentally challenged sister, Lilly (Lilly Jandreau). His few friends provide him a drinking outlet but it is the rodeo that makes Brady, the man. If a cowboy cannot ride, then what good is he? These be Brady’s own words. With his injury his brain is sensitive and riding rodeo might be the end of him. Zhao builds good characterizations. The father is not a one sided cardboard has been. Despite his constant arguments with his son, it is shown at the end that he understands Brady and his decisions. Brady’s anguish, anger and decisions are also well displayed. The horse training and rodeo segments are effectively shot and exciting enough. Joshua James Richards captures the landscape of the open areas of the west, where horses run free. Simple storytelling, a good human story and one dealing with nature always make a good film.